Dermatix Silicone Gel is a clinically proven advanced topical gel that claims to help prevent scars in fresh wounds and reduce immature scars. It also claims to soften, flatten, and smooth scars, as well as, relieve itching, pain, and discomfort associated with scars. Dermatix Silicone Gel claims to be recommended by surgeons, dermatologists, and leading specialists worldwide. Dermatix Silicone Gel just lists ingredients as an advanced topical silicone gel. That is all that is listed. Dermatix Silicone Gel states that it can be applied to most areas of the face, joints, and other body parts. No other usage information is provided for this product. There are no possible side effects listed for this product, however it does claim that results can be seen within four weeks. 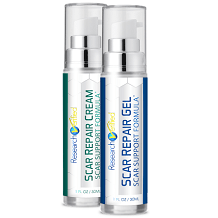 Dermatix® Silicone Gel seems a little expensive when compared other scar treatment options. Dermatix Silicone Gel provides some information as to the return policy. They do not accept returns on any opened products. There is a contact number and an online contact option for the manufacturer in Great Britian. This means that if you purchase a tube and are not happy with the results, then you have no recourse other than to seek another scar treatment option. If the product is unopened, then the refund will be processed within 30 days. This seems to be a little long to process a refund. While Dermatix Silicone Gel is a good product, it does not have a clealy defined money back guarantee and that is never a good thing.